The quest to buy good Go-Sanke Koi in smaller sizes and grow them with both quality and size enough to be able to compete for Supreme Champion award at major Koi shows, I know this is by far the cheaper option but is it possible or not? There’s no question that many Koi kept in ideal conditions will live for 25 years and even longer; however at some point in their lifetime there will be ‘the right time’ for them as far as Koi shows are concerned and with Koi, this is usually a period that lasts for a maximum of five years generally although there are some exceptions especially with male ‘bonsai’ Koi in medium sizes. Unlike humans who enter beauty contests and the like where this can be a ten year period that lasts generally between the ages of 18 to 28 years of age this is not so with Nishikigoi that are entered into Koi beauty shows. Some can be at their most beautiful between one to five years old, others can be at their most beautiful between three to eight years old whilst others can be at their most beautiful from 13 to 18 years old and all five year periods in between but very seldom after 18 years old. So bearing in mind the show rules state that Supreme Champions need to be Go-Sanke and over 85cms, then it seems obvious that if enthusiasts are looking for smaller sizes to grow to become contenders for Supreme Champion award then these need to be selected at smaller sizes from the ones that will be at their very best when they are between 13 to 18 years old. Needless to say, this is not exactly the easiest thing in the world to be able to do unless of course there are a few very accurate crystal balls to hand. Today there are many prestigious Koi shows held in countries all around the world with the Shin-Ko-Kai All-Japan Dealer’s Koi show heading the list and the ZNA All-Japan Koi show in second place. At both these events it’s becoming increasingly rare to see a Supreme Champion that’s less than 100cms long. Now here’s a bitter pill to swallow. For as long as I can recall and I have lost count of all the All-Japan/ZNA shows I’ve attended since 1982, as you can imagine all of these Supreme Champions were positively magnificent at the show and the year in question but unless I’m mistaken, not a single one was entered into the show directly from the owner’s pond. Instead it was delivered and entered to the show by the breeder who had been keeping it in his own water on behalf of the owner. Whether the time period was only three months or five years makes no difference to the fact that it was the breeder who kept the Koi and not the owner. Then there’s another fact that none of these Supreme Champions were bought for peanuts, if the truth is known the price paid for most would make one’s eyes water. So, once more, is it possible or impossible to find a Go-Sanke in small sizes that will one day take Supreme Champion award at a prestigious Koi show – anywhere in the world? Of course the Koi breeders of Japan have been well-aware of all this for many years hence the reason for staging what is probably the third most important Koi show in the world to we enthusiasts – namely the ‘Wakagoi Show’ (Wakai Goi – Young Koi) staged every spring. In terms of importance to the breeders who enter Koi from all parts of Japan, this show is perhaps THE most important Koi event of the year. At this show the breeders wish to show visitors that equally beautiful Koi, albeit in smaller sizes to the giants, can also be produced and are being produced for all to see. As a result the top size limit for entry to this show is 60cms – which now, believe it or not, can mean a Koi that is not yet even 24-months old. Returning to the All-Japan show, there are around 16 size classifications; this really means there are 16 separate shows in one show and in real terms each should be as important as the next but ‘size matters’ and so it’s only the Supreme Champion in size 16 that gets the applause and the coverage simply because experts have voted it to be the very best Koi in the world. The Wakagoi show has around 8 size classifications and each should be as important as the next but it’s only size 8 that produces the Supreme Champion award and gets most of the accolades. If you inspect some of the best entries at the Wakagoi show in all size classifications, many are perfect bonsai versions of some of the Supreme Champions seen at the All-Japan show but their chances of going on to actually take these awards in later years are absolutely ZERO. These Koi are blossoming NOW and that’s far too early for the future because by the time the future arrives most of their present beauty will have been lost long ago. So where are the other Koi that could be entered into the Wakagoi show right now that will go on to take Supreme Champion at the All-Japan show in later years? Be assured there are many waiting in the wings for the chance to compete in the future, but to enter them into the Wakagoi show right now would be foolish because there’s not a chance that any one would even be awarded a ‘Third’ prize. Right now, these Koi are unattractive and in some cases even downright ugly, but they also happen to be some of the finest tategoi in Japan! Contrary to popular opinion, these special Koi are not hidden away from view, they will be seen swimming with the other stocks on display but it’s rare that the casual visitor will ever look at them twice. Even if a visitor did ask about one, a wise breeder would say the Koi has already been sold which would save hours of explanation as to why the Koi is probably the most valuable and thus most expensive Koi he’s ever produced. As to the BKKS National show Supreme Champions not one of these has been purchased in a smaller size and later gone on to take the Supreme Champion award. In every example I can recall, all of these were purchased in large sizes. The nearest I’ve ever seen to this being achieved was the Kohaku that took Supreme Champion award at the South East show in 2011 which was also the most prestigious Koi show held in the UK that year. I bought the Koi from Marusei in November 2003 at yonsai when she was 62cms long. This means the Koi was 3.5 years old at the time of purchase, 62cms is not exactly small but nor is it large by today’s sizes achieved. My purchase that day at Marusei was a five Kohaku purchase – all yonsai and the price I paid was simply the total requested as ‘price for all’, so when I had them safely home I also had to decide the sales prices. This particular one was head and shoulders over the others especially as far as ‘pattern’ was concerned and so was priced the highest. The other four less-expensive ones sold relatively quickly but this particular one wasn’t sold until September 2004 to Paul Williams at 64cms, by then she was four and a half years old and gosai. The rest of the story revolves around how meticulous Paul is as a Koi keeper. In fact when I rang him recently to confirm my dates were correct, he apologised for taking some time to answer his phone, reason being he was out cleaning his filters! Paul uses no modern-day gizmos on his pond, his filters comprise of vortex units and filter mat cartridges and the water he uses comes straight from the tap. He is finicky about the food he feeds but his greatest talents are observation and a strict maintenance regime. In September 2011 Paul entered his Kohaku into the South East show at 86cms – that’s a growth of 22cms over seven years, which averages around 3.14 cms per year. 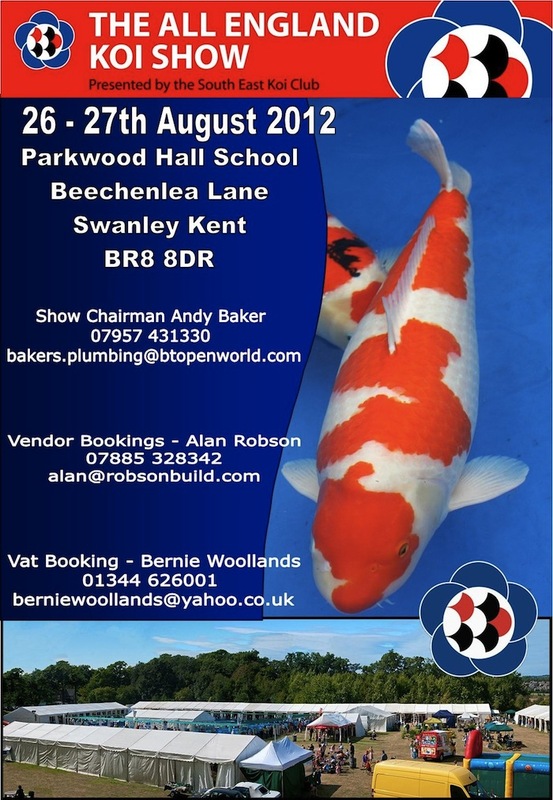 Not Japanese mud pond growth rates by any means but the improvement in body; texture of beni and the condition of the skin was remarkable however the best thing I noted is that the Koi is still tategoi as can be seen on this poster advertising this year’s South East show! My customers have been entering my Koi into the BKKS National since 1982. Since then there has been 26 BKKS Nationals and last year the South East was the most important show. That’s 27 in total, allowing for the odd cancellation, my Koi have taken nineteen of the GC’s at these shows and I also studied closely the other eight that were sold by other dealers. There are hundreds of Koi that have been bought in the UK at 62cms and have grown to 86cms and beyond but to be fair the vast majority of these have not been Go-Sanke. I only know of one Go-Sanke bought in the UK at 62cms that’s gone on to reach 86cms AND THEN taken Supreme Champion award at a major UK Show and this Koi belongs to Paul Williams. So, to be honest it IS possible to buy a good Go-Sanke in smaller sizes and grow it to be good enough and big enough to take the Supreme Champion award at a major UK show. But please don’t ask me to give you the odds of actually doing this!